Property Location Located in Gatlinburg, Reagan Resorts Inn is on the Strip and minutes from Circus Golf and Amazing Mirror Maze. This hotel is within close proximity of Star Cars Museum and Ripley's Haunted Adventure. Rooms Make yourself at home in one of the 63 air-conditioned rooms featuring refrigerators and microwaves. Rooms have private balconies or patios. Complimentary wireless Internet access keeps you connected, and cable programming is available for your entertainment. Private bathrooms with shower/tub combinations feature complimentary toiletries and hair dryers. Amenities Take advantage of recreation opportunities such as a seasonal outdoor pool, or other amenities including complimentary wireless Internet access and a television in a common area. Dining A complimentary continental breakfast is served daily from 7 AM to 10 AM. Business, Other Amenities The front desk is staffed during limited hours. Free self parking is available onsite. 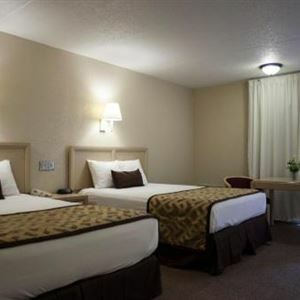 Located in Gatlinburg, Reagan Resorts Inn is on the Strip and minutes from Circus Golf and Amazing Mirror Maze. This hotel is within close proximity of Star Cars Museum and Ripley's Haunted Adventure. Make yourself at home in one of the 63 air-conditioned rooms featuring refrigerators and microwaves. Rooms have private balconies or patios. Complimentary wireless Internet access keeps you connected, and cable programming is available for your entertainment. Private bathrooms with shower/tub combinations feature complimentary toiletries and hair dryers.